Monterey, CA (August 28, 2018)—British Sports Car Hall of Fame Director and noted British vehicle book author John Nikas honored Kjell Qvale, founder of the Qvale Auto Group and co-founder of The Pebble Beach Concours d’Elegance this weekend as part of his posthumous induction into the British Sports Car Hall of Fame. "NEW YORK — If luxurious sport-utility vehicles are America's new obsession, let the infatuation continue. 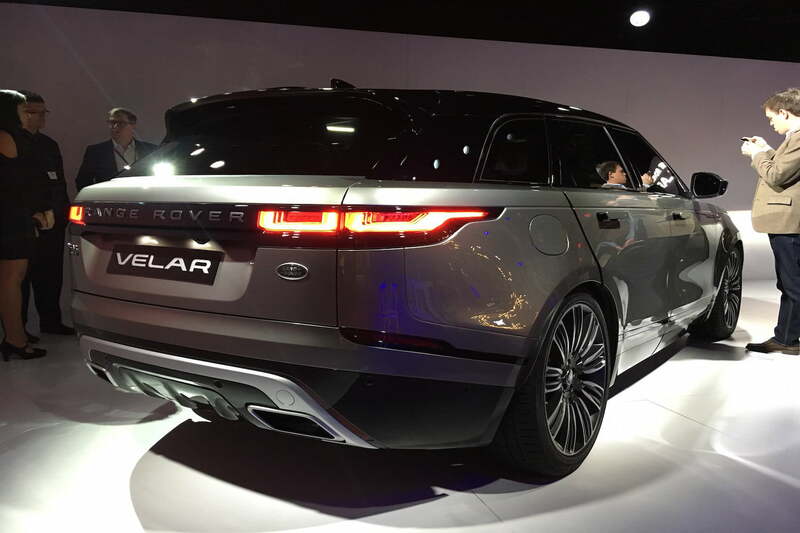 The trend added a new flavor Tuesday with the introduction of Land Rover's Range Rover Velar in an event near the New York Auto Show. The Range Rover Velar, which made its global debut in March at the Geneva Motor Show, will hit U.S. dealerships "later this year," Jaguar Land Rover said. The automaker said the basic model of the 2018 model-year mid-size SUV will start at $49,900. 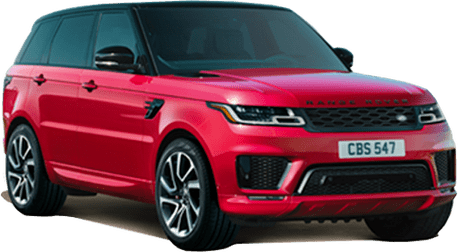 It's the fourth version of the Range Rover, a nameplate that has proven to be quite lucrative for Jaguar Land Rover as Americans abandon cars and snap up luxurious high-riding crossover vehicles. 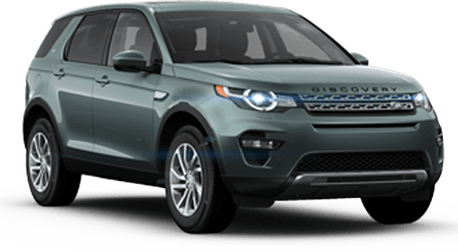 Jaguar Land Rover said the SUV would come in three powertrain variants: a 4-cylinder, 180-horsepower, 2-liter turbocharged diesel engine; a 4-cylinder, 247-horsepower, 2-liter turbocharged gas engine; and a 6-cylinder, 380-horsepower, supercharged 3-liter gas engine. Several trim levels are available. 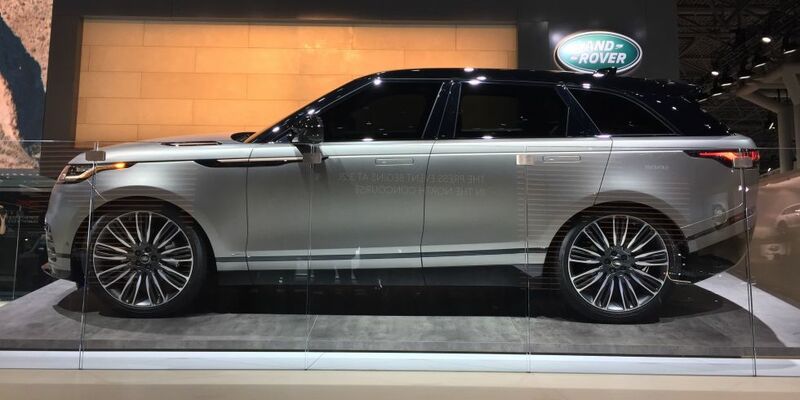 In the first year only, the company will also make 500 units of the Range Rover Velar First Edition featuring a Meridian Signature Sound System and special paint finish." Bomey, Nathan. "Singer Ellie Goulding hails new Range Rover Velar." USA Today. Gannett Satellite Information Network, 12 Apr. 2017. Web. 20 Apr. 2017. 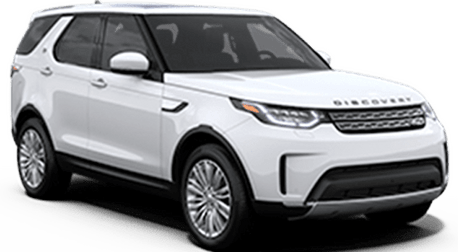 "Land Rover offers luxury SUV models with proven off-road standards, and this one you might actually be able to afford. At a packed venue within Hearst Plaza, Lincoln Center, Ellie Goulding took to the stage to present Land Rover’s fourth Range Rover model. After a live performance, Goulding showed off the Velar and shared her impressions of the SUV – she was the first person to drive the model in North America. Goulding will also host a charity auction of the Velar at the East Side House Settlement Gala later this week. Slotting between the Evoque and Range Rover Sport, the Velar pioneers new design themes for the luxury brand. We’d hasten to call this the most attractive Land Rover model ever, thanks in part to its low-slung stance and long wheelbase. Signature exterior features include a high beltline, cab-rearward shape, and sloping roofline. Viewed from above, the Velar’s lower half appears completely disconnected from its greenhouse. In other words, the defined character line wraps completely around the SUV’s exterior. The Velar’s cabin is equally groundbreaking for Land Rover. 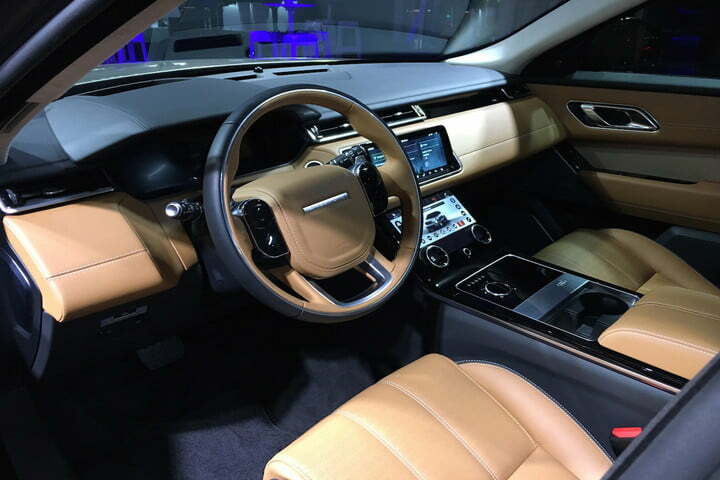 Elegant minimalism is the best way to describe the latest Range Rover’s interior. Physical buttons are a thing of the past, replaced by a 10.0-inch touchscreen infotainment display above a new glass panel. When the vehicle is brought to life, climate settings and drive modes are accessible on the panel. 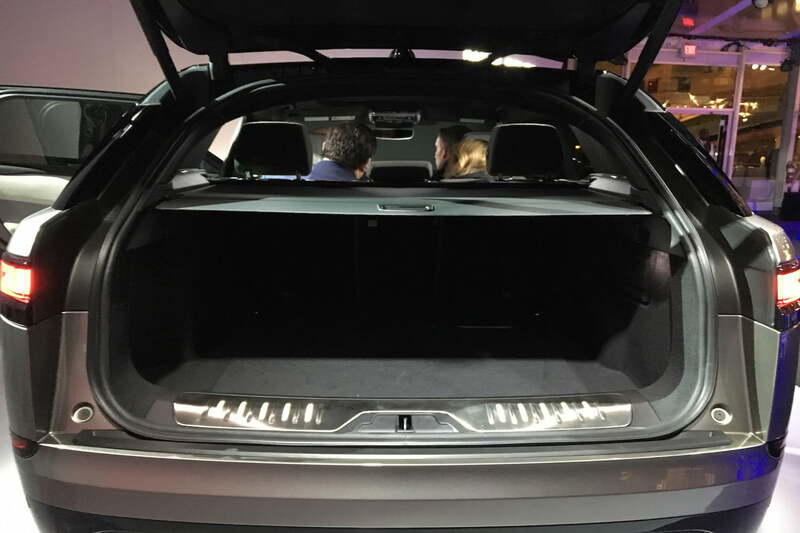 When the Velar is turned off, the panel goes completely blank. Leather seating surfaces are standard on the Velar, but those wanting something more unique can choose sustainable textile fabrics by Kvadrat. Powertrains options include an Ingenium Diesel with 180 horsepower and 317 pound-feet of torque, a four-cylinder gas engine with 247 hp, and a supercharged V6 with 380 hp. Whichever engine you choose is paired to a ZF eight-speed transmission. All-wheel drive will be standard on every Velar, but a four-corner air suspension, locking rear differential, Terrain Response 2 drive modes, progress control, low traction launch, hill descent control, and gradient release control are optional off-road goodies. Equipped with the adaptive suspension, the Velar has a ride height of up to 9.88 inches and can wade to a depth of 25.59 inches. Yes, it’s a looker — but this is still a Land Rover, and that means it can go far off the beaten path. 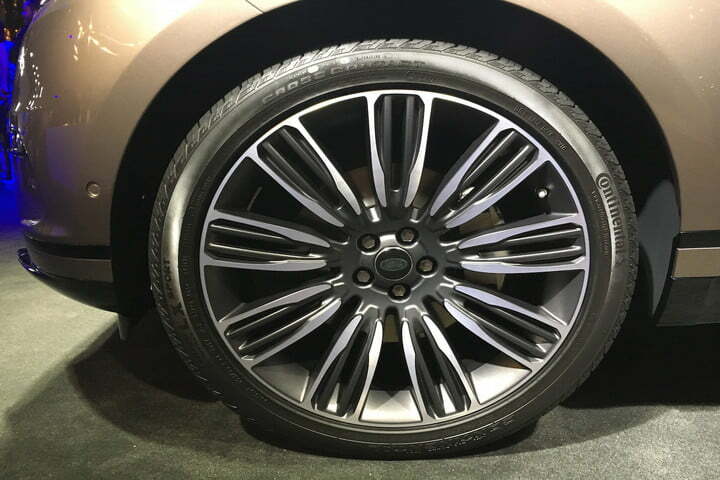 The Range Rover Velar will come in two design variants: standard guise, and an R-Dynamic kit with black accents, unique bumpers, and optional 22-inch wheel designs. Four distinct trims fall beneath these two configurations: Standard, S, SE, and HSE. Above these, a limited run of 500 “First Edition” models will be offered. The entry-level Velar will be priced from $49,900 and arrives at dealers later this year." Branman, Miles. "The all-new Range Rover Velar dials up Land Rover’s design and interior technology." Digital Trends. N.p., 12 Apr. 2017. Web. 20 Apr. 2017. "Sitting between the entry-level Evoque and the higher-priced Range Rover Sport, the Velar will the be the pick of the litter for American buyers. 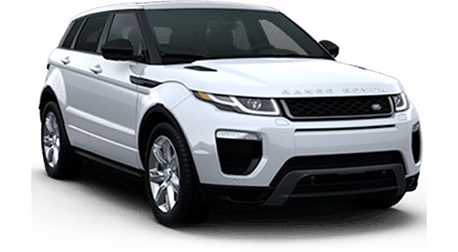 Range Rover has often been the go-to brand for the wealthy looking for a big comfortable mode of transportation that can also drive through an unpaved mountain at a moment's notice. 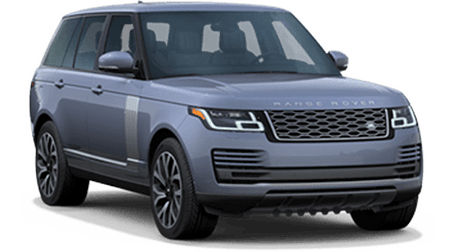 But because not everyone has the $90,000 necessary for a flagship Range Rover, the brand has released more economical models to fill the gap. The latest one is this, the Velar. 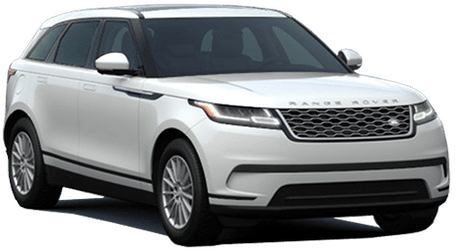 The Range Rover Velar, at first glance, may not seem any different than its bigger, more expensive Range Rover Sport sibling. The shape and fascia are generally the same, all the way down to the headlight design. Like the F-PACE, the Velar will be available with a turbocharged four-cylinder gas engine, a four-cylinder turbodiesel, and a 380-horsepower supercharged V6. Range Rover says the Velar—like every other Range Rover—will have some seriously competent off-road capabilities. Terrain Response and Active Progress Control modes, as well as a self-leveling air suspension, will be available as options. But even as standard, the Velar should be able to wade and crawl with the best of them. At a starting price of $50,895, the Velar will fall squarely in the white space between the Evoque and Sport in terms of price as well. Sitting in the sweet spot for many buyers, the Velar will surely be one of Land Rover's best-selling vehicles. Once you throw in those clever Tesla-style flush door handles, and there's no doubt the American public will fall in love." Silvestro, Brian. "The Velar Will be Range Rover's Best-Selling Car." Road & Track. N.p., 12 Apr. 2017. Web. 20 Apr. 2017.